Rainwater harvesting is the collection and storage of rain from roofs or from surface catchment for future use. The water is stored in tanks to be saved or directed into mechanisms used for groundwater recharge. Rainwater harvesting is used in many countries such as western Britain, China, Brazil, Thailand, Sri Lanka, Germany, Australia, and India. The concept of rainwater harvesting dates back as far as 6,000 years ago in China. 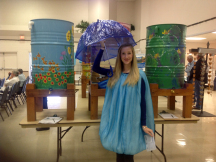 Harvesting rainwater is a great way to stretch your water dollars and save water, too. A system can be simple or complex, inexpensive or more costly. It can also be attractive. In most communities, about 35 % of water use is applied to landscape irrigation. 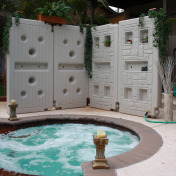 Using a rainwater harvesting system can help reduce demand on our water supply as well as reduce water bills. 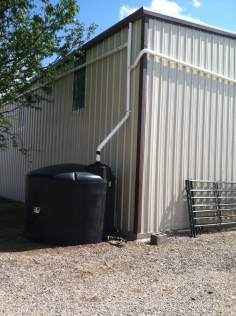 Rainwater harvesting can also help prevent flooding and erosion, reduce contamination of run-off, and turn storm-water problems into a usable water supply. Approximately 0.62 gallons per square foot of collection surface per inch of rainfall can be captured. This tends to vary because some water is lost in the first flush of the system, splash-out or overshoot in hard rains, or possible leaks. Some rainwater can be lost if the tank is full. Smooth run off surfaces provide a more efficient method for capturing rainwater during intense rainfalls. 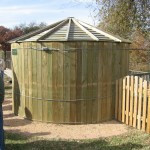 See PGCD’s Rainwater Harvesting Brochure or check out Texas AgriLife’s publications for more information. For a tour of the office to see the District’s system, please call 806-883-2501. 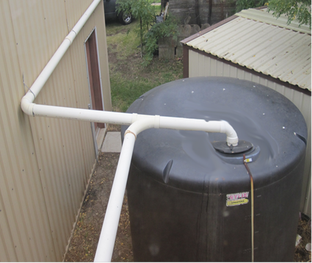 PGCD is offering a rebate incentive for residents, landowners and tenants in our District interested in installing a Rainwater Harvesting System. Please click here to see if you qualify and for more information on the rebate amount and system requirements. Most supplies needed for your system can be found at your local home improvement store.